“I had a cousin, Randall, killed on Iwo Jima. Have I told you?” So begins the story of a young woman, Ellen, coming of age in the long shadow of World War II. Forty years later, she relates the events of this period, beginning with the death of her favorite cousin, Randall, with whom she shared Easter Sundays, secrets, and perhaps, love. In an isolated, aging Maryland farmhouse that once was a stop on the Underground Railroad, Randall had grown up among ghosts: his father, Sterling, present only in body; his mother, dead at a young age; and the apparitions of a slave family. When Ellen receives a package after Randall’s death, containing his diary and a book called The Gardens of Kyoto, her bond to him is cemented and the mysteries of his short life start to unravel. 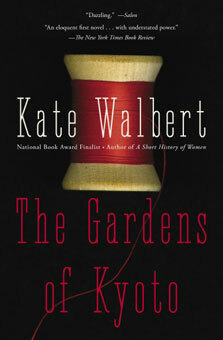 With lyrical, seductive prose, Walbert spins several parallel stories of the emotional damage done by war. Like the mysterious arrangements of the intricate sand, rock, and gravel gardens of Kyoto, they gracefully assemble into a single, rich mosaic.